"'Cursed be [Ham]! The lowest of slaves will he be to his brothers.' [Noah] also said, 'Blessed be the Lord, the God of Shem! May [Ham] be the salve of Shem. May God extend the territory of Japheth; may Japheth live in the tents of Shem, and may [Ham] be his slave'" (Genesis 9:25-27). During the years of slavery in Britain and the United States, some perverted individuals used the Bible to justify their actions of enslaving men and women to work for them. While the Bible certainly does not justify slavery or racism, it does explain it. Out of Shem came the people we would refer to today as the Eastern peoples. From Shem's line came all the major religions that we have today as well: Christianity (through Abraham), Islam (through Ishmael, through Mohammed), Hinduism, Buddhism, and others. The Native American people in North America also came from the descendants of Shem, which partly explains their deeply held religious beliefs of the Great Spirit, etc. Noah blessed Shem, his second oldest son, and said Ham would be lower than he, and that Japheth would "dwell in his tents." This phrase seems to point to the relative peace between Shem's nations and Japheth's nations throughout history. From Ham came the people we would call today the Africans. Instead of blessing Ham, Noah cursed him, the youngest of his sons, since Ham had disgraced his father by looking upon his nakedness and not covering him up himself, but going to make mockery of him with his brothers instead. It was Shem and Japheth who covered their father's nakedness instead of making a mockery of it. Throughout history, Ham has been the servant and slave of both his brothers, as seen in the conquests of Ham's nations and the slave trades of Europe and the United States. Japheth's line produced the people we call today the Europeans. Most of the conquering nations came from Japheth's line throughout history. The Greeks, Romans, Byzantine, British, Russian, and American empires all descend from the line of Japheth. Japheth has always sought control over others through war and policies. Noah's blessing to his oldest son, Japheth, seems to point to his dominance: "May God extend the territory of Japheth." 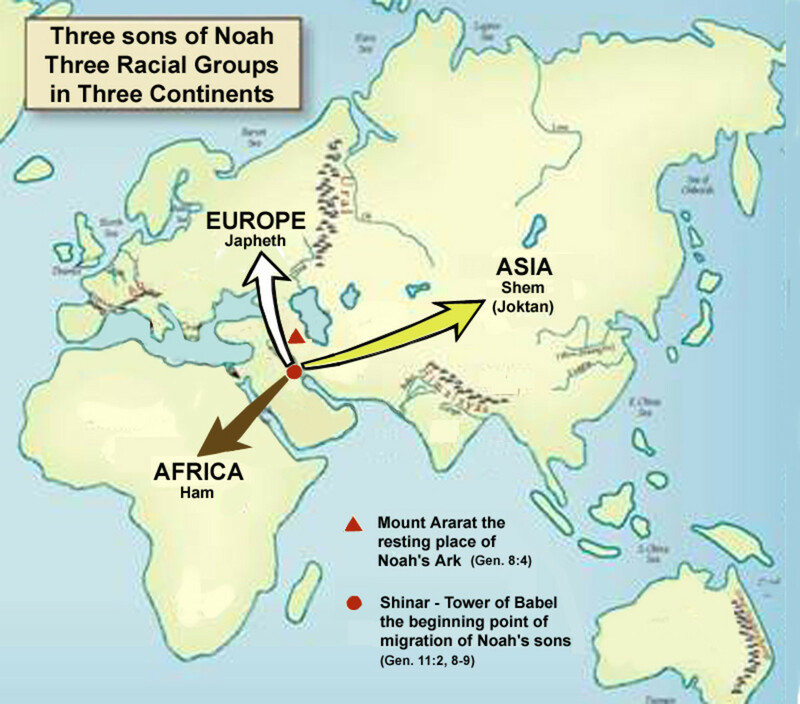 The descendants of Japheth were the explorers and conquerors of much of the world throughout history, expanding their territory vastly and taking over groups of people in the process. As I mentioned in the beginning of this article, the Biblical account of Noah's blessings over his sons is not a justification for the mistreatment of some people groups, nor is it just cause for announcing the prominence of some over others. What the Biblical story of Noah does provide, however, is rational and logical evidence as to the path of each line of descendants. So then, does this leave people stuck in their places of societal hierarchies or ancestral curses? No, it does not. There is a leveler to all blessings and curses; there is One who brings reconciliation between brothers. It is the through the Gospel of Jesus Christ that peace and reconciliation comes to the sons and daughters of Japheth, Shem, and Ham. The Gospel does not allow Japheth and Shem to enslave Ham and mistreat him. The Gospel does not allow the injustices done to the descendants of Shem and Ham by Japheth. The Gospel does not allow for the hatred or the curses of Shem and Ham toward Japheth. The Gospel does not allow for racism or prejudice or injustice or envy or covetousness or greed or hatred or evil of any kind. The Gospel brings peace where there once was none, not only between God and man, but also between man and man, brother and brother, sister and sister. "There is neither Jew nor Greek, there is neither slave nor free, there is no male and female, for you are all one in Christ Jesus" (Galatians 3:28). It is Jesus Christ who brings peace to the world. There is no peace for man found in any other man, policy, or agreement. Give the world Christ and you will give the world love, joy, and hope.